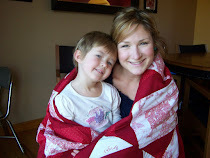 More than a few of you mentioned that our family's blankie saga would make a good children's book. I chuckled and (then cringed) a bit after hearing that. I also said that there's already been a book written on the subject. It's called Knuffle Bunny by Mo Willems...except in Knuffle Bunny, someone always makes sure the beloved Bunny returns to its owner. We have both of those books: Kuffle Bunny and Knuffle Bunny Too. But what I didn't realize until today is that there is a third and final installment in the series: Knuffle Bunny Free. I found it completely by accident while browsing a bookstore at the mall this evening. When I found it, I sat down and read it right there in the aisle of the store with my kids sitting around me. The story is a masterful ending to a marvelous series and it spoke right to my heart and where I am as a Mother right now. Well-done, Mo Willems...I just want to hug you right now! I wouldn't dream of giving an part of this story away, but as in the other books, Trixie and Knuffle Bunny find themselves separated by a series of events. I love it when Trixie dreams about what Knuffle Bunny is doing, places he visits, other children he would meet and comfort in his travels. The way the story all comes together is so perfect...and the note to Mo's daughter at the end of the book makes the whole series complete. So, at a time when the world is enjoying the fruition of the Harry Potter series, our family is celebrating the very satisfying finale of the Knuffle Bunny collection...If you've ever loved a special toy or blankie, you NEED to read this book...all three...but especially the third! I'll be back next week to share the other great book finds from this evening! Ahh! Thanks for posting this! Like you, we have book one and two, and didn't know there was a third. Can't wait to buy it! It's really quite cute how much your son loves his blankie. What a great thing you did for him to make another, and so quickly! Wow. I recently discovered Knuffle Bunny Free, as well. It is very touching. Did you know that the Pigeon always finds his way into all of Mo Willems' books? (He's kind of jealous of others being the star.) My daughter heard him speak at a literature conference a few years ago and this was one of the tidbits he gave, along with teaching them how to draw the Pigeon.